While you are focused on selecting a fly pattern to match the likely prey inhabitants living in a particular type of flats habitat, note that the speed at which the fly sinks may be an equally important consideration. The depth of the flat, the type of bottom, the force of the current, the relative calmness on the water surface, the location of permit within the water column, and how to manipulate the fly are all important factors in fly selection. For this reason, your fly collection should not consist of predominantly weighted flies. When you are on the water, have a single “primary” fly box ready with one or two flies of each type, pattern and weight to be ready for a quick change in diverse conditions. If possible, have multiple rods rigged to have an alternate prey source fly imitation ready. Finally, if you find it manageable, consider having a rod ready in a second stripping bucket out of harm’s way in the skiff cockpit, to further capitalize on an alternate fly strategy. Here is a secret weapon of mine: slide a 1/32-ounce worm weight or an even lighter tungsten conehead in front of the loop knot that secures the fly, or slide it down the tippet by clipping and then re-tying the blood knot connecting the two sections of leader. It is faster than re-tying the loop knot that attaches the fly. Doing this, I instantly convert an unweighted or lightly weighted fly into one that gets to the bottom immediately or can be fished at any depth throughout the water column. Furthermore, because of the symmetrical shape of these weights, your fly will not spin or behave erratically. An added benefit in using these external weights is the ability to fine-tune the casting properties of the fly in relation to the rod weight and fly line as well as adapt to different flats depths or calm or windy conditions. I have experienced no reduction of strikes from permit when fishing in this manner. I paint my weights either olive or tan (matte not glossy) and carry them in my pocket in a small Ziploc bag. Determining the “best” tidal phase to chase permit is a moving target. It always depends on a combination of conditions including the speed and direction of the wind and the intensity of the current. Although most of us fish a full day on the flats, if I were to cherry pick the prime times of each tidal phase, I prefer the period of one and a half to three hours after the start of the incoming tide, and the first half hour to two and a half hours after the tide begins to fall. These time slots most often provide the optimal push of current and the greatest presence of feeding permit. In the Florida Keys, where predicted tides vary so much within short distances, I try to select flats to fish that remain within these parameters. As a generalization, expect to find smaller permit during the early to mid-incoming tidal phase. The good news is these “smaller” permit, especially those grouped in schools, tend to be more aggressive feeders. Also, you are less likely to encounter permit that have already eaten, have been laid-up asleep, or are traveling off a flat. If wading after permit is a priority, I want to be on the flats less than one hour on the incoming tide. There should typically be enough of a vertical rise in the water height and flow of current to draw permit on to a flat. Beyond this permit could spread out and become more difficult to find. Later in the tidal phase, the permit may also have already fed, and become more selective about chewing on your fly. More often than not, the period of one to two and a half hours into the outgoing tide has provided me with more quality encounters with large permit than any other time. Intuitively, it has always felt as though I would meet more permit, too. Not only do the cuts, shelves, channels, rips and basins become active with permit during the enhanced current flow. 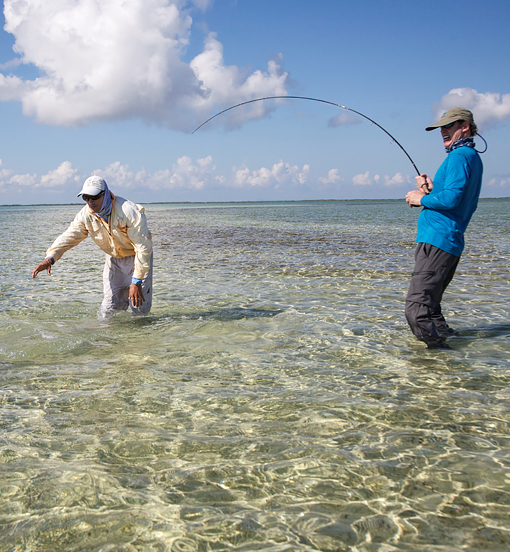 Permit, large and small, head out of the mangroves, backcountry and deeper troughs on the flats through a less defined pattern of travel than during the skinny water of the initial incoming tide. As a result, encounters are more random and can occur in more places. In general it’s wise to rig your fly rod with a weight-forward tapered fly line, one line-size heavier than the rod maker recommends. Let’s face it, Murphy’s Law guarantees that the wind is more likely to be howling at more than 20 knots than a muted 10 knots. Certainly, other folks hold a different opinion. However, throwing a long line is seldom as important as loading the rod quickly and delivering an accurate 50- to 60-foot cast. As unlikely as it seems to the novice permit angler, your target is typically only 25 to 40 feet away—unsuspecting and ready to eat. With an over-lined rod you should be able to make an easy roll cast to the fish, instead of waving your rod back and forth several times while the fish either changes direction or spooks. In permit fishing, 25 to 50 feet is the terminal distance range where the rod must load, carry and deliver the fly line. When making a longer cast, the goal is to shoot the heavier forward section before carrying more of it in the air in the form of another false cast. Do you wear clunky boots while in the skiff that thump against the fiberglass deck and cause you to step on your fly line too much? Bare feet are the ultimate in feel and stealth. However, exposing your bare feet to the sun too long will result in sunburn and you could possibly burn the bottom of your feet on a hot deck. On a skiff I compromise by wearing only socks, which I customize by applying a very thin coat of 3M Bondo (www.bondo.com) mixed with a small amount of sand to the sock bottoms. This modification provides better non-skid traction should the deck get wet. My toes can feel a fly line if I am stepping on it, and my feet make no banging noises. If I expect to be wading I keep a pair of conventional wading sandals handy. If wading is the primary objective, I wear sandals or wading shoes. In and around coral your ankles must be protected. Slipping a pair of neoprene gravel guards over your sandals converts them into suitable wading shoes. In coral wading boots are a must. Try to avoid thick-soled boots that might accentuate “crunching” noises while wading. When you fish over thick turtle grass, your only visual clue of spotting a permit may be the sudden sight of a tight mud puff from the bottom. More often than not, that permit spotted its prey from high up in the water column before diving and capturing it. An anatomically realistic crab that lands softly in the right spot and sinks more slowly than most commercial patterns will often entice a permit that wants to feed. Relaxed permit are curious creatures. First, the permit knows he can catch that crab. So when that fish is intrigued enough to move to your fly to inspect it, it becomes his idea. In such instances, I often do nothing to manipulate the fly. If the permit is losing interest, I may gently twitch the fly once to activate movement in the legs or claws of the fly. Imagine a crab that tries to sneak unnoticed to the bottom. It’s not sprinting. You may be pleasantly surprised at the response to this tactic. Fishing with a suspender crab (an unweighted fly with light shot on the tippet) is a good choice where there is significant current, or if you want your fly to hover just over the top of turtle grass. After all, what is the point of making a great cast only to have the pursuing permit lose your fly in the grass? Or the fish finds your fly with salad attached to it. 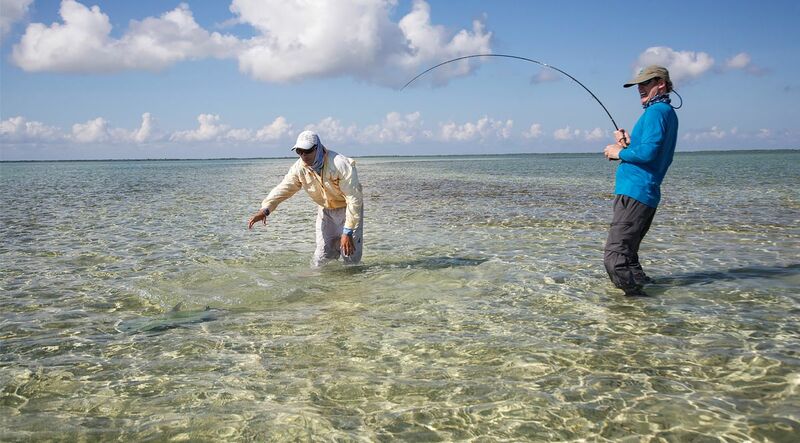 Teasing a permit with a lightly weighted shrimp fly that you can strip actively can do the trick, too, especially along transitional edges of vegetation or the edge of the flat itself. Try this “water column” approach. It is a real kick when you have orchestrated your own plan and tactics for a particular type of water and succeed. One of the great pleasures in your permit fishing thereafter will consist of creatively exploring different tactics and flies with a broader purpose in mind. 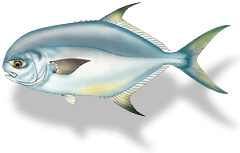 The behavior of a permit is such that it often nimbly and swiftly targets the claws of a crab first, attempting to disarm a crab that stands its ground and fights before the permit engulfs it. Fishing in a lagoon one morning I witnessed quite a show. The water surface was calm. Enough so that I was able to spot a permit tail, a sizable one at that, about 200 feet away. What made this scene interesting was not the fact that I got a shot at this fish. Rather, the permit had detected a crab along the shallow mud bottom some five feet away from it. You could see the permit get excited as the subtly exposed tip of its tail elevated slightly while starting to wag back and forth. In a flash, the permit darted forward, its movement embellished by a dramatic visual push and an audible whoosh where the surface parted water. Stopping abruptly and tipping its head downward, the permit, I’m sure, had visions of a feast. Instead, the permit streaked away in a sizzling, serpentine pattern. There was no question this permit received a sharp pinch on the lips from the crab, having squared off to face the fish and defend its turf. This behavior relates to why I tie many of my crabs with less imposing claws. Sure, they have to be there. Using foam claws that rise up in the water as the crab sinks adds a large degree of realism to the fly, too. Yet there is no point in accentuating a feature that might cause the permit to tail up on your fly and grip and rip a claw. After all, the claw is hookless—unless you go off the deep end with your fly design. A more sensible fly design encourages the permit to ingest the entire body of the fly, resulting in a higher percentage of hookups. How many permit are you looking at? If it is a cluster, not only should you be counting and examining eyeballs, you need to decide via an “educated guess” the direction in which the permit will proceed. Anticipating the directional movements of a school of moving permit is most often influenced by the actions of the flanking individual permit near the front or middle of the pack. If there are two to four permit, try to lock in on the movement of the dominant, energetic individual standing out from the others. How are they moving? Are the permit feeding steadily, moving slowly? Where are they in relation to each other? Spread out or in a tight formation? Select your target fish. Definitely pick a single fish. Don’t “flock shoot.” To do so is to risk “lining” at least one of the permit, which will spook and take his buddies with him. At the same time, try to consider beforehand the scene that will unfold should your accuracy be off, or if a crosswind correction is needed to avoid drifting your leader over other permit in the group. Tight loops may look cool and aid in driving a fly more accurately into a strong wind. However, try not to get hung up on the idea of casting perfect loops. Although worth striving for, tight loops are not always the casting objective. Open loops, too, have their place in permit fishing. In a headwind or strong crosswind, throwing tight loops is a difficult goal for even the best casters to achieve. Frequently, timing the movement of a permit may require you to change the cadence of the cast by speeding up your delivery, or changing direction prior to shooting the fly. Crosswind components may find you releasing a curve cast where you turn over your wrist at the last moment to steer the fly as compensation. If there is a considerable headwind or crosswind, you may decide to alter your release point so that the fly is aiming at the water surface, rather than dropping from above the surface. In calm conditions, it is preferable to choose a high release so the fly can lands softly on the water. The concept of figuratively aiming directly at the permit’s head with your fly, also referred to as “hook him or spook him,” is usually most effective on a tailing permit. The expression is, however, a conundrum. On the one hand, crabs do not fall out of the sky only to bonk a permit on the head or descend with an accompanying plonk. After all, crabs only become aggressive with permit when they are placed on the defensive. On the other hand, if you try to get tricky or too conservative with your lead or placement and land the fly four to five feet away from the fish, it may go unseen. Equally important, when you factor in wind and a moving target, it seems rational to attempt the shortest, most accurate cast you can make. 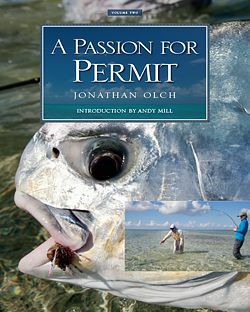 In spite of the permit’s elusiveness, the game of fly fishing for permit frequently allows and requires multiple shots at your target fish. Mentally, there is a huge difference between the commitment to aim your fly directly at the fish and being conservative by leading the permit by several feet or “feathering” the cast to avoid spooking it. With a tailing permit, go for the jugular vein. Try to drop the fly on the permit’s head. Ideally, the result will be the fly lands six to 12 inches to the side or in front of the permit. Publisher’s Note: These tricks and tips come from many thousands of hours of the author’s experience fishing some of the most productive saltwater flats in the world. They are practical and proven. 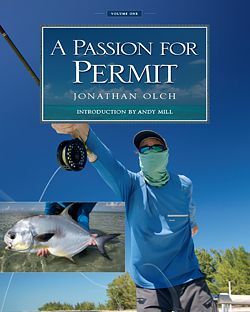 And they are a mere tiny sampling of what’s in store for you as you make your way through the engaging pages of A Passion for Permit.